Born: 1866, Anstruther, Fife, Scotland. Died: 22 October 1926, St James, Western Cape, South Africa. John D.F. Gilchrist, marine biologist, was educated at Madras College in St Andrews, Scotland, and then studied at Edinburgh University, obtaining the degrees Bachelor of Science (BSc) and Master of Arts (MA). He was awarded an 1851 Exhibition scholarship for advanced studies and research, which enabled him to study feeding in marine fishes. After further studies at the universities of Munich and Zurich he was awarded the degree Doctor of Philosophy (PhD) in geology by the University of Zurich. His main interest, however, was marine biology, which led him to Naples, Monaco and the Isle of Man. 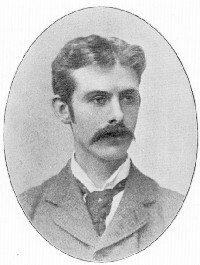 He returned to Edinburgh in 1892 as assistant lecturer in zoology. At this time he translated E. Haeckel's Monismus als Band zwischen Religion und Wissenschaft... into English. It was published in London in two separately titled volumes, Monism (1894) and Confessions of faith of a man of science (1903). On 7 December 1895 Gilchrist was appointed Marine Biologist in the Department of Agriculture of the Cape of Good Hope, arriving early in 1896. The post was renamed Government Biologist in 1900. His recommendation that a marine biological survey be undertaken was accepted by the government and a small steam vessel for this purpose acquired in Scotland, equipped to his specifications, and named the Pieter Faure. The survey, carried out under his direction with great drive and enthusiasm, started in 1897. The results were of great scientific and practical importance and included the discovery of new stocks of hake near Dassen Island in 1897 and rich soling grounds off Mossel Bay a year later. The survey was extended to Natal waters in 1901 at the request of the government of that colony, but no promising trawling grounds were found there. The specimens collected included hundreds of new species and several new genera of marine organisms, and many more that had not been observed in South African waters before. On Gilchrist's recommendation the government built a small biological laboratory for marine research at St James in 1902, where further studies on the life histories of marine organisms were carried out, particularly on the eggs and early development of local marine fishes. The building also provided Gilchrist with accommodation at times. Although the focus of the survey was on marine fauna, he also recorded sea temperature and salinity as a means of studying ocean currents. His activities and observations were written up in his annual Report of the Marine Biologist for 1896-1899, Report of the Government Biologist for 1900-1907, and other scientific publications. He described many new species himself, while others were sent to overseas specialists such as G.A. Boulenger*, G.B. Sowerby*, T.R.R. Stebbing*, S.J. Hickson* and J. Stanley Gardiner*, whose descriptions were published in the six volumes of Marine investigations in South Africa (1902-1910), the first marine science journal in southern Africa, which Gilchrist edited and to which he contributed many papers. The director of the South African Museum in Cape Town, W.L. Sclater*, appointed him as honorary curator of marine invertebrates in September 1896, thus providing him with space to store his specimens. Later he was involved in a lengthy dispute with the museum over the ownership of the Pieter Faure collections. It took the intervention of Prime Minister J.C. Smuts to settle the dispute in favour of the museum. Gilchrist resigned his position in December 1910, when a full-time curator of marine collections was appointed. He and his assistant at the museum, W.W. Thompson*, published a comprehensive "Catalogue of the sea fishes recorded from Natal" in the Annals of the Durban Museum (1914-1917, Vol. 1, pp. 255-431). Thompson's studies of the taxonomy of marine fishes under his guidance also led to several joint publications. From about 1907 Gilchrist made a study of freshwater fishes and with Thompson as co-author published a monograph on "The freshwater fishes of South Africa" in the Annals of the South African Museum (in 2 parts, 1913 and 1917). Gilchrist was an examiner in botany (1902-1903) and zoology (1903, 1912-1916) for the University of the Cape of Good Hope. From about 1905 his list of academic degrees changed from "MA, BSc, PhD" to "MA, DSc, PhD", which seems to indicate that he was awarded the Doctor of Science degree by the University of Edinburgh only at this time. Around 1905 he accepted an (additional) appointment as supervisor of marine studies at the South African College (from 1918 the University of Cape Town), and in 1907 succeeded Arthur Dendy* as professor of zoology. J. Stuart Thompson* served as his teaching assistant. He retained the chair to 1926, shortly before his death. However, his continued preoccupation with marine studies and his absences at sea led him to neglect some of his university duties. Teaching held little appeal for him. Though his post as Government Biologist was abolished in 1907 for financial reasons, he continued to play the leading role in the Department of Agriculture's marine survey, serving as Chairman of the Fishery Advisory Board, and after 1910 as Director of the Fisheries Survey of the Union of South Africa as well as fisheries adviser to the Cape Provincial Administration. In the latter capacity he compiled four Marine Biological Reports covering activities during the years 1912 to 1917, which contained many of his specialist papers. The marine survey was revitalised around 1920 when a converted whaler, the Pickle was provided for this purpose. Gilchrist led expeditions in it as far as present Maputo on the east coast and Walfish Bay on the west coast and discovered a vast new trawling ground for Cape hake north-west of Cape Town. As Director of the Fisheries Survey he issued Reports No. 1-4 of the Fisheries and Marine Biological Survey for the years 1920 to 1925, again with many specialist contributions by himself. In addition to the publications already mentioned, Gilchrist contributed numerous scientific papers to the Annals of the South African Museum, the Transactions of the South African Philosophical Society, the Transactions of the Royal Society of South Africa, the Reports of the South African Association for the Advancement of Science and some overseas journals. Included are many papers on the marine fishes of the Cape and Natal, their eggs and early development, through which he established ichthyology as a scientific discipline in South Africa. Many more papers dealt with the morphology and biology of diverse groups of marine invertebrates. For example, he described new species of hemichordates (1908), a new genus of crawling medusa (1918), a new enteropneust (1925), and investigated trematode parasites (1918). In 1911 his text-book for students, South African zoology, was published in Cape Town. Later he and C. von Bonde* wrote Dissection of the platana and the frog (Cape Town, 1919) and Practical zoology for medical and junior students (Edinburgh 1922). The totality of his pioneering research, and particularly its wide scope and combination of fundamental and applied work, was of the utmost importance for the development of marine biology in South Africa and of a scientifically based local fishing industry. Gilchrist actively participated in the activities of scientific institutions and societies. From 1898 to at least 1908 he was a member of the Meteorological Commission of the Cape of Good Hope. He joined the South African Philosophical Society in 1896 and served on its council from 1898 to 1903, was president in 1904-1905, vice-president in 1906, and treasurer in 1907. When its successor, the Royal Society of South Africa, was founded in 1908 he was elected a foundation Fellow, served on its council from 1908 to 1910, and as president from 1918 to 1922. He was a founding member of the South African Association for the Advancement of Science in 1902 and served as joint secretary during its first seven years. In 1905 he was joint editor (with W. Flint*) of Science in South Africa, written in preparation of the joint meeting of the South African and British Associations for the Advancement of Science in South Africa that year, and contributed a chapter on "The South African marine fauna and its environment". The South African association awarded him the South Africa Medal and grant in 1917, and he served as its president in 1923. His presidential address dealt with "The South African seas". In 1916 he became a foundation member of the South African Biological Society. He was a corresponding member of the Zoological Society of London, a Fellow of the Linnean Society of London, and an honorary member of the Societe Centrale d'Aquiculture of Paris. He was a well-liked and modest person, with a reputation of being an absent-minded professor. He married Elfreda R. Raubenheimer, with whom he had one son and one daughter. Failing health forced his early retirement in 1926. He visited Europe to recover his health, returning in July 1926, but died soon thereafter at the marine laboratory at St James. Annals of the South African Museum: List of papers published in Volumes 1-30. Edinburgh: Trustees of the SA Museum, 1938. Brown, A.C. John D.F. Gilchrist and the early years of marine science in South Africa. Transactions of the Royal Society of South Africa, 1997, Vol. 52(1), pp. 2-16, with list of papers; also in A.I.L. Payne & J.R.E. Lutjeharms (eds), A century of marine science in South Africa (pp. 2-16). Cape Town: Sea Fisheries Research Institute and Royal Society of South Africa, 1997. Brown, A.C. Marine invertebrate systematics and zoogeography in southern Africa. Transactions of the Royal Society of South Africa, 1999, Vol. 54 (1), pp. 21-30. Cape of Good Hope. Civil Service List, 1897-1907. Cape of Good Hope. Report of the Government Biologist, 1900-1902, 1904. Cape of Good Hope. Report of the Marine Biologist, 1899. Cape of Good Hope. Report of the Meteorological Commission, 1898-1908. Cape of Good Hope. Report of the trustees of the South African Museum, 1896-1899, 1907. Day, J.H. Marine biology in South Africa. In A.C. Brown (Ed. ), A history of scientific endeavour in South Africa (pp. 86-108). Cape Town: Royal Society of South Africa, 1977. Gon, O. A history of Ichthyology in South Africa. Part II: John D.F. Gilchrist, the father of South African Ichthyology. Ichthos, September 1993, No. 39, pp. 17-18. Marine investigations in South Africa, 1900-1903, Vol. 1-2. Department of Agriculture, Cape of Good Hope. Royal Society of South Africa. Transactions, 1908-1925, Vol. 1-12. Scientific African, February 1896, pp. 61-63, Notes. Smith, J.L.B. The sea fishes of South Africa (5th ed.) Central News Agency, 1965. South African Journal of Natural History, September 1919, Vol. 1(1), p. 274-277, Members of the South African Biological Society. South African Journal of Science, 1923, Vol. 20, presidential address; 1935, Vol. 32, p. xl: Award of the South Africa Medal; 1937, Vol. 34, p. xiii, Presidents of the Association. South African Philosophical Society. Transactions, 1897-1907, Vol. 9-17. Union of South Africa. Fisheries and Marine Biological Survey, Report No. 1-4, 1920-1925. Union of South Africa, Province of the Cape of Good Hope. Marine Biological Report, 1912-1914, No. 1-2. Von Bonde, C. Obituary: John Dow Fisher Gilchrist. South African Journal of Science, 1927, Vol. 24, pp. 612-613.